Explore Spain’s National Art Museum, the Prado Museum, along with a professional, local guide and a group of a maximum of 30 people. This 2-hour tour will lead you through the museum for you to learn all the details about the building and the exquisite artwork inside it. 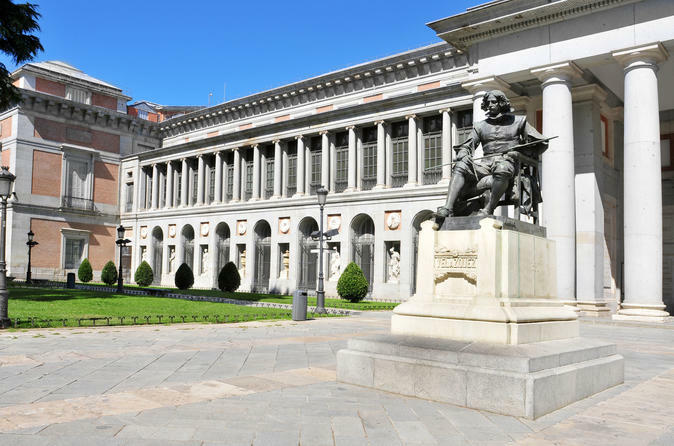 Meet your guide at the Velazquez Statue at the Prado Museum to begin your tour of Spain’s National Art Museum. Your guide will lead you through the museum, which first opened its doors as a museum in 1819. Learn about the building and the incredible artwork housed in this 18th-century Neo-Classical building. You will see works by such great European artists as Velázquez, Goya, Raphael, Rubens, and Bosch, as well as other major Italian and Flemish artists. Your tour will conclude at the museum.